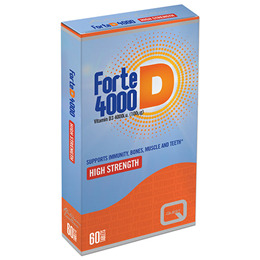 Quest Forte D is a high potency vitamin D supplement to support bone and immune health. Vitamin D contributes to the normal function of the immune system and muscles. It is needed for the utilisation of calcium in the body and helps to maintain bones and teeth. Vitamin D is naturally created by the body through exposure to sunlight. Individuals with limited exposure to sunlight are recommended to take a vitamin D supplement. Other groups at risk of low levels of vitamin D include; individuals with darker skin tones, the elderly, pregnant and lactating women, children and those with serious illnesses or who have been hospitalised for long periods. Microcrystalline cellulose, dicalcium phosphate, vitamin D3 (sucrose, cholecalciferol, hydrolysed bovine gelatin, corn starch, dl-alpha tocopherol), croscarmellose sodium, anti-caking agent: silicon dioxide, magnesium stearate. One tablet daily with or after a meal. Do not exceed the stated dosage unless instructed by a qualified health professional. Store in a dry place, below 30°C. Below are reviews of Forte D - Vitamin D3 4000iu - 60 Tablets - Best before date is 31st May 2019 by bodykind customers. If you have tried this product we'd love to hear what you think so please leave a review.